During my "semi vegetarian diet" days, I baked a brownie made from tofu and soy milk. 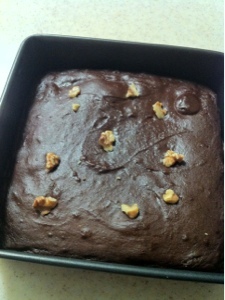 It tasted pretty moist and yummy for a vegetarian brownie :) *Measurements are in grams. I find it more accurate. This is a very easy recipe. Enjoy! ***Preheat oven to 180 degree Celsius. 6) Pour over pan that fits (no worry about puffing too much, it won't).